As a child, when we drove down Henry Avenue in East Falls on the way to my grandmom's house, my mom would often point out the mansion across from a park that was Princess Grace's house. 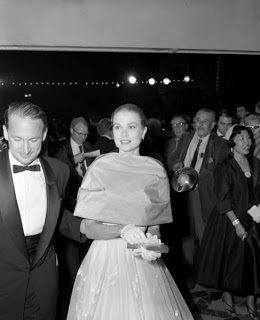 Although I knew little about Grace Kelly, whose greatest fame was before my time, thinking about how a little girl from Philadelphia just like me ended up reigning over a Eurpoean county was intriguing. 1. Becoming a famous movie actress wasn’t her dream job. Grace wanted to be a stage actress, but had to settle for being a famous movie star. After roles in High Noon (1952) and Mogambo (1953), she starred in Dial M for Murder (1954) and Rear Window (1954). She won an Academy Award for Best Actress for her role in The Country Girl (1954). 2. Young Grace preferred reading or making up games and stories to athletics or other pursuits. Grace grew up in a red brick mansion at 3901 Henry Avenue in East Falls that was built by her father. She attended Ravenhill Academy, a nearby convent school, for elementary school and the Stevens School in Germantown for high school. When she was 12, she appeared in Don't Feed the Animals presented by the Old Academy Players in East Falls. 3. She made her professional debut at the Bucks County Playhouse. Grace performed in the comedy The Torch Bearers in summer 1949. Grace was itching for a gig since she had studied acting at the prestigious American Academy of Dramatic Arts after her high school graduation in 1947. 4. Grace hated Tinseltown. Though Grace moved to California for work, she never really liked it. Grace once remarked, “I hated Hollywood. It's a town without pity. I know of no other place in the world where so many people suffer from nervous breakdowns, where there are so many alcoholics, neurotics, and so much unhappiness." 5. She hosted a number of celebrities at her family’s shore house. The year Grace was born, her dad built a white Spanish-style brick beach house at the corner of 26th and Wesley in Ocean City, NJ. When Grace migrated to OC as an adult, she brought along friends like Frank Sinatra, Bob Hope and Bing Crosby. 6. Despite all of her worldly success, Grace had a hard time impressing her father. John Kelly tried to discourage Grace’s pursuit of acting, and even as Grace gained international fame as an actress, he didn’t acknowledge her success. When Grace won her Oscar, her father told a reporter, “Peggy’s the family extrovert. I’ve always thought her the daughter with the most on the ball.” At least Grace did score points with her mother for her engagement to Rainier, who remarked, “Imagine, the daughter of a bricklayer is going to marry a prince." 7. She spent only a handful of days with Prince Rainier before accepting his marriage proposal. 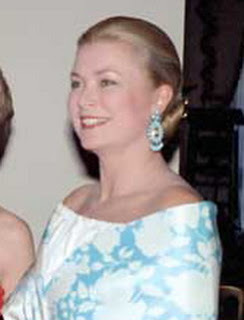 Grace met Rainier during a photo shoot at his palace in Monaco during the Cannes Film Festival in May 1955. Though their 45-minute encounter was pleasant, it was not love at first sight. Grace and Rainier got to know one another when Rainier visited the U.S. at Christmastime 1955. The whirlwind courtship ended in an engagement announcement on January 5, 1956 at a luncheon at the Philadelphia Country Club. 8. She had such mixed feelings about her royal wedding that she didn't look at the photo albums of it for 2 years after the wedding. Though her mom originally lobbied for a wedding at the Kellys’ parish church, St. Bridget’s in East Falls, Grace married Rainier on April 19, 1956 in an ornate public ceremony in the Mediterranean principality. The relentless media storm clouded the wedding and overwhelmed Grace and Rainier. But Grace accepted her new role as Princess Consort and produced three royal heirs—Princess Caroline, Prince Albert and Princess Stephanie. 9. She almost appeared in a film several years after assuming the throne, but the displeasure of the Monégasques squelched the deal. In 1962, Grace managed to convince a reluctant Rainier to support her taking the leading role in Alfred Hitchcock’s Marnie. The announcement of her intentions set off a wave of excitement in America, as well as a firestorm of disapproval among Monégasques, who wanted their princess off the screen and on the throne. To keep the peace, Grace withdrew from the role. 10. Princess Grace sent her old Philly neighbors Christmas cards. Despite her royal station, Grace displayed one of the traits of a true Philadelphia—someone who always remembered where she came from. As Philadelphians mourned her death, her former next door neighbor reported that he still received a hand-signed Christmas card from her serene highness of Monaco every year. What do you remember about Grace Kelly? Did you know that being a movie actress wasn’t her dream job? What would your family be surprised to learn about you? Share your thoughts in our comments. I remember going to Monaco in 1982 and could not wait to see her. Fortunately she drove out the Palace and I saw her. Also I was taken buy a director of SBM, Monaco, to see her personal beauty suite at the Hotel de Paris. Saw her also in person in 1982. It was in April and that November she died. What a shock.